I was dry-eyed but my voice faltered. We were sitting in the drawing room of Miss Caseborne’s Boarding Seminary for Young Ladies, surrounded by a press of empty chairs and heavy mahogany furniture. When Maud Greenwood’s father dies suddenly she is forced to start work as a governess. Left with no money and no known family she starts her working life. Two years later she has walked out of two jobs and been fired from a third. The future looks grim. Then she receives a letter from a cousin she never knew she had. Juliana Greenwood offers her a home, food, and promises of a good life in the future. But when Maud arrives at Windward House she finds things are different to what she imagined. She is unsure whether her cousins promises are the truth and things seem a lot more sinister than she ever expected. Anyone who reads this blog regularly will know that I love historical fiction and I often complain I don’t read enough of it, mainly as there isn’t a lot out there for teens at the moment. The Devil in The Corner was released by Hodder Children’s books recently and as soon as I saw the email about it I knew I would have to read it. Sinister goings on in an old mansion house in Suffolk in 1868? A bit of sociology thrown in as its mainly about women of that time? An element of romance? It sold me from the second I read the blurb and now I’ve read the book I’m desperate for more from the author. The Devil in the Corner was my first Patricia Elliott book and I am certain it will not be my last. I loved the writing and it flowed so well. The obvious element of suspense in the writing was brilliant and the way she conveyed the feelings of the characters had me grinding my teeth and calling out in frustration throughout the book. The story was very much focussed on the situation Maud had found herself in and how at that time she could do very little about it. I studied sociology at A Level and its one of the things I have always loved reading about in historical fiction, the way life was for women and just what they could and couldn’t do. One of the things I loved about this book was the way it featured very strong female characters despite being set in a time when females weren’t viewed as strong… and yet it was still very realistic. Maud was strong but niave, a powerful and dangerous way to be in that time as she soon found out. Edie was quite possibly my favourite character due to her strength as it came about through love for her family, among others, and she was very calculated with it – she’s not a likeable character but definitely an interesting one. As with most historical fiction there was some elements of the story speficially that annoyed me. The obvious disregard for women and the way they needed a man to look after them, the way men could be however they wanted and weren’t viewed badly – unless they made a fool of themselves in public – and the way a women was treated as a liar in the eyes of many. However Patricia Elliott put all this across very well and I loved the whole book for it. The addition of the art piece and the sinister element that gave to the book was fantastic too and I really loved that. It was interesting to see how different people reacted to The Doom and how people’s reactions changed throughout the book too. I would definitely recommend The Devil in the Corner even if you are a bit apprehensive about historical fiction and I am off now to find more by the author to devour! 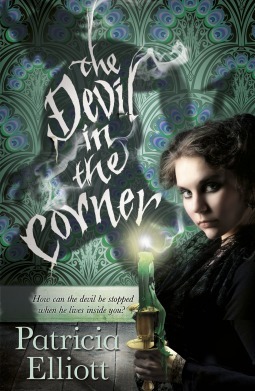 The Devil in the Corner was published on March 6th by Hodder Children’s Books. My copy was sent to me from the publisher in exchange for an honest review.